A review of Hybrid Ambitions: Science, Governance, and Empire in the Career of Caspar G.C. Reinwardt (1773-1854), by Andreas Weber. By focusing on late eighteenth- and early nineteenth-century Dutch science Andreas Weber’s doctoral thesis, Hybrid Ambitions: Science, Governance, and the Empire in the Career of Caspar G.C. Reinwardt (1773-1854), bridges two periods which historians often analyze separately from each other. Aside from epistemological changes associated with the first and the second “scientific revolution,” the two periods offer us different scholarly types and contexts. Early modern science is typically associated with polymaths striving for a virtuous life, and scholarly work produced within the realm of the Republic of Letters. Science in the nineteenth century saw the emergence of new scientific professions and a range of scientific disciplines, many of which flourished in national and imperial contexts. The historical period dissected by Andreas Weber is also one involving great political upheavals in the Low Countries: the French Revolutionary and Napoleonic Wars set the scene as the Dutch Republic was reformed into a monarchy. The history of Dutch long-distance trade and colonization changed as well. The rise of the British Empire continued to have profound effects on the trading and colonial activities of the Dutch; the occupation of parts of the Dutch East Indies by Britain in 1811 and the return of the same areas in 1816 form one of the important backdrops to this study. Andreas Weber writes a history of science that draws on these developments by following the life and career of Caspar G.C. Reinwardt (1773-1854), a generally overlooked Dutch naturalist and some time professor at Leiden University. Chapters 1 to 6 follow the life of Reinwardt; the first focusing on Reinwardt’s activities in Amsterdam, as an apprentice working in his brother’s chemical workshop, in a trade that supplied large quantities of chemicals to Dutch processing industries. Chapter 1 discusses the larger context of the declining role of Amsterdam as a staple market of the world and how chemistry was viewed as a means by which raw material could be utilized more efficiently. Such thinking promoted a wide range of educational programs, the aim of which was to promote Dutch chemistry. Partaking a diverse range of more scholarly activities in Amsterdam, Reinwardt became incorporated into the capital’s patriotic intellectual elite. The domestic social and political scenes form an important backdrop to Chapter 2, which follows Reinwardt’s work. In 1800, Reinwardt was appointed professor of natural history at the University of Harderwijk. The promotion corresponded to changes taking place in the years following the Batavian Revolution of 1795. Patriotism and the zeal to improve Dutch society compensated for his lack of diplomas and degrees; during the first year of the new century Reinwardt was active in a range of committees turning to science to find solutions to problems facing the new Republic. This work involved domestic journeys and the writing of extensive reports on agriculture and public health. Alongside his administrative jobs, Reinwardt also taught botany and chemistry to medical students and others at the University of Harderwijk. Chapter 3 sees Reinwardt’s appointment as director of a new botanical garden and menagerie in Haarlem, a position granted him by Louis Bonaparte, Napoleon’s brother and King of Holland between 1806 and 1810. Although the institutions he was in charge of never materialized under his spell as director, the promotion placed Reinwardt in contact with a range of influential individuals and societies. Reinwardt continued to combine scholarly activities with administrative assignments, compiling inventories of natural resources within the new state with the aim of advancing Dutch economy. In this capacity he survived the political shift in 1815, as William I of the Netherlands assumed power. At the time Reinwardt was professor at the Athenaeum Illustre (later University of Amsterdam). The new political regime found a way of making use of Reinwardt’s abilities; in Chapters 4 and 5 Andreas Weber explores Reinwardt’s activities in the Malay Archipelago as senior administrator and scientist in Dutch service. Reinwardt was given the responsibility of surveying Java’s agriculture, its industries, public health, and educational system with the aim of improving them. Natural history was also part of the job description; Reinwardt was expected to provide the State Cabinet of Natural History in Amsterdam with collections of specimens. Multitasking in the colonies proved a complex business though, not only was Reinwardt’s portfolio quite large, unfortunate circumstances meant that several large shipments of specimens were lost at sea. The two chapters also capture Reinwardt’s endeavors on foot, travelling the colonies with the aim to gather information about political, economic, and social conditions, but also conducting scientific fieldwork, studying the geography and geology of the areas he passed through. Chapter 6 discusses Reinwardt’s problems with capitalizing on his travels and scientific work after he returned to Holland. At the end of his life, Reinwardt was professor in natural history at Leiden University, engaged in teaching but with little to show in terms of published material from his journeys in Asia. Although engaged in writing up the natural history of Dutch colonies (Flora Javae), Reinwardt played a peripheral role in this endeavor. Other travelling scientists (e.g. Carl Ludwig Blume, 1796-1862), and collector-scholars (e.g. Coenraad Jacob Temminck, 1778-1858) managed to sideline Reinwardt as they took charge of the natural history of the East Indies. The somewhat disappointing end to Reinwardt’s career also reflected on the fact that his patrons and promoters at home lost faith in him and his work, as they adopted a more pragmatic approach to colonization than the one that Reinwardt came to represent. Reinwardt’s work, as an administrator and scientist in the Dutch East Indies fitted at first with the new regime’s ambitious program to turn the colonies into a profitable business by administrating it in a “rational” way, making use of scientific data and extensive information-gathering. The reforms were however costly, and soon enough the new regime streamlined the colonial budget, although the scientific exploration of Malay Archipelago continued. Reinwardt’s work, including the methods he used, had however its own trajectory. Making use of methods and instruments central to chemistry and statistics, and applying them on nature, he was inspired by the science of plant geography. Reinwardt’s approach to the study of nature did also follow in the wake of Alexander von Humboldt (1769-1859), who was genuinely impressed by Reinwardt’s work on the geology and geography of the Dutch East Indies. Humboldt’s identity as a scientific traveller, and the political context in which he operated, where the improvement of agriculture, economy and science stood at the forefront, overlapped with Reinwardt’s early life and life plans. However, unable to apply his science so as to generate profit for the nation, Reinwardt was not able to convert his fieldwork into a successful scholarly career. Moreover, although important tools for generating knowledge, statistical tables were not “hard currency” in Europe; national natural history museums and collectors wanted exotic specimens not numbers. With little to bargain with in the form of dried plants and taxidermied animals, Reinwardt was bypassed by those offering samples of animals, minerals and plants for exchange. It is within the debates on the circulation of scientific knowledge, and the need to take into account the surrounding social, economic and political context, that Andreas Weber situates his dissertation. The discussion of previous research involves a critical analysis of the work of Lewis Pyenson and Andrew Goss on Dutch colonialism and science and the extent to which science can be separated from colonialism. Bruno Latour and his “center of calculation” model forms another starting point for a critique on the need to take into account how knowledge is renegotiated in a series of places and contexts, outside those included in Latour’s account. Weber is also using the life and journeys of Alexander von Humboldt as a model with which to understand Reinwardt. Historians are already quite familiar with the history of Dutch science in the seventeenth and eighteenth centuries; Andreas Weber’s work is helpful in providing us with a rich empirical study of the tail end of early modern science and how it overlapped with the coming of modern science. He raises a series of challenging questions on how colonialism and science interacted with each other, and how scholarly careers were negotiated in the early nineteenth century. Andreas Weber’s study provides the reader with a rich and relevant background on a range of individuals and institutions, the twists and turns of Dutch politics in revolutionary times, and its implication on academic work and colonial politics. Leiden University. 2012. 263 pp. Primary Advisors: Leonard Blussé and Lissa Roberts. 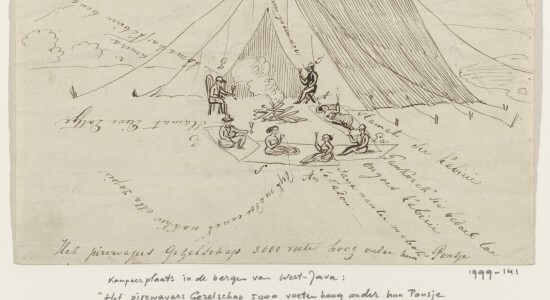 Image: Illustration of Professor Reinwardt’s fieldwork in Java, by Jannes Theodore Bik, ca. 1819. From the Rijksmuseum, Amsterdam.